/ Sun Safety Tips For Kids.. 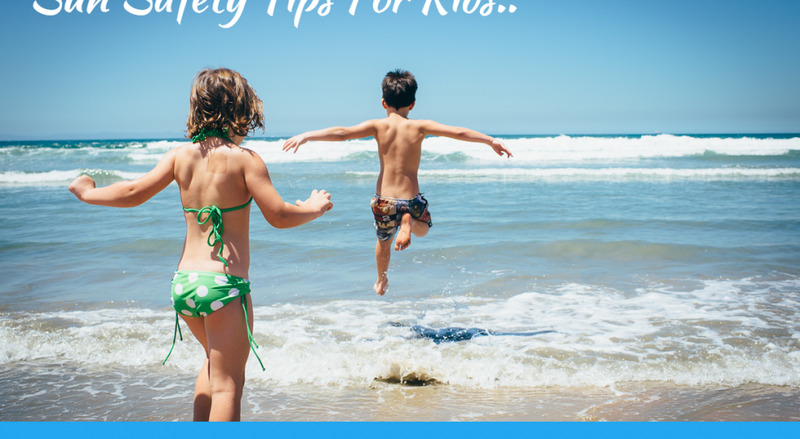 Whether you’re at the beach or just running errands, keep your children safe in the sun with these tips for skin protection. Toddlers love to run and play in the sun, and protecting their delicate skin from ultraviolet light can help prevent both short- and long-term damage. From sunscreen products to protective clothing to stroller covers, these simple tips can help keep toddlers safe in the sun during family summer fun. When it comes to little ones, all sunscreens are not created equal. For example, clear or gel-like alcohol-based products may burn your toddler’s skin. Try a lotion or creamy product with an SPF between 15 and 30, and test a small area on your child’s arm first to see if she’s sensitive to a particular sunscreen. If there are no adverse reactions, apply a generous amount of sunscreen 30 minutes to an hour before exposure to the sun. That allows the sunscreen’s protection to become most effective. If your toddler will be in and out of water, apply a waterproof sunscreen product every couple of hours to maximize protection. While your child’s engaged in water play, ensure your kids swim pants have a snug fit and won’t swell up in water like regular diapers. Clothing can provide an excellent barrier to screen out the sun’s rays. While short-sleeve tops and shorts help keep kids cool in warm weather, the best outfits comfortably cover as much of the skin as possible any time kids are outdoors. Dress your toddler in long-sleeve tops and pants made of tightly woven but loose-fitting fabrics. Hold the items up to the light — if you can’t see through them, they’re what you want. Look for brands of children’s clothes that are lightweight and specifically made for sun protection. In a pinch, a long, white adult T-shirt also works well. Top off your child’s sun-safety attire with a wide-brimmed hat. When you’re out and about this summer, remember these helpful tips, too. Apply lip balm with an SPF of 15 or more to your toddler’s tender mouth, and an opaque zinc oxide sunblock on exposed areas such as nose, cheeks and ears. On the beach, keep your child in the shade with a large umbrella that helps prevent the sun’s rays from reflecting off the white sand. When you’re out for a walk, make sure the stroller offers plenty of shade, with a hood or other protective structure. Australia’s reputation as the “sunburnt country” is legendary — almost part of our national identity, really — but the latest findings from Roy Morgan Research reveal that we may slowly be losing our toasted rosy glow, as sales of sunscreen and sunblock increase. This growing tendency to buy sunscreen coincides with a slight increase in the proportion of Australians who are ‘worried about getting skin cancer’: from 57.9% of the population in 2014 to 58.9% in 2015 (an additional 307,000 people). “Australia has come a long way in terms of skin-cancer awareness and sun protection since the days of the original ‘Slip, Slop, Slap’ campaign. In fact, the latest data from Roy Morgan shows that the proportion of Australians 14+ buying sunscreen has grown by almost 30% in the last two years alone. Given that non-melanoma skin cancers are the most common kind of cancer in Australia, and melanoma is in the Top Five, this is surely good news. “However, there is still considerable difference between the states, with Tasmania lagging dramatically behind the rest of the country. Tasmania’s UV index can be as high as any of the mainland states, so there is no logical reason for Tasmanians’ low sunscreen-buying rate, although the fact that Tasmanians are less likely to be worried about getting skin cancer may have something to do with it.